Europe’s SMART-1 spacecraft has struck the Moon, mimicking this artist’s view of a small but powerful meteor strike on the lunar surface. 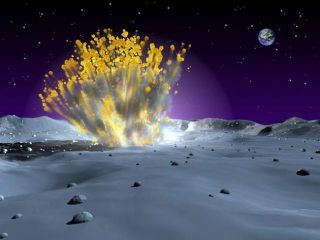 Shown here is “ejecta” or the spray of debris that follows a natural or a human-made impact, unimpeded by gravity or atmosphere. A European lunar orbiter was purposely slammed into the Moon today. The high-tech spacecraft-Small Missions for Advanced Research and Technology-belongs to the European Space Agency (ESA), and is better known as SMART-1. The controlled crash of the probe was staged to allow a ground-based network of astronomers to possibly examine material kicked up from the Moon by the impact, thereby squeezing additional science out of the mission. Predicted effects from the high-speed crash ranged from a quick flash to a possible fireball if the spacecraft ricochets across the lunar surface due to leftover hydrazine fuel onboard SMART-1. Moments before impact, scientists did not know what to expect. "Suddently we lost the signal of the spacecraft," said Detlef Koschny, ESA SMART-1 scientist at a control center in Germany, who spoke to reporters via a teleconference arranged by the Planetary Society. "All we know is that the impact did occur." Koschny said that the impact occurred within seconds of the predicted time. The impact was indicated by the loss of communication from the craft, which was destroyed. Impact was at 1:42 a.m. ET. "They went out with a bang," said Bruce Betts of the Planetary Society. The high-speed slam dunk was expected to create yet another crater on the Moon-perhaps some 16 feet to 33 feet (5-10 meters) across. Dust and other material ejected off the Moon were expected to possibly be visible to observers with big telescopes back here on Earth. A flash from the impact was recorded by the Canada-France-Hawaii Telescope atop Mauna Kea, but no details were available at the time this update was published. The image is here. A handful of reporters and astronomers using large backyard telescopes in California, Colorado and Washington state did not see anything in the initial moments after the impact. Meanwhile, a host of participating observatories around the globe were in wait and watch mode, all set to help ESA monitor the impact of SMART-1 on the Moon. Facilities in Australia, South America, Europe, Africa, South America, as well as in the United States were at the ready to observe smashing finale of the spacecraft. ESA engineers had been finessing SMART-1 during its extended mission to permit impact of the craft to happen on the Moon's near side-in a dark part near the terminator-good observation conditions for Earth-pointing instruments. SMART-1 was busy carrying out imaging duties even on its last day of being alive. Scientists and the spacecraft's flight control team tested a fast-tracking imaging mode with the craft's star tracker, normally used to orient SMART-1 in space. The star tracker produced images of the Moon while the spacecraft was flying steadily closer to the rugged lunar surface. ESA ground controllers also wrestled with a pre-crash SMART-1 problem when the spacecraft went into safe mode. An intense six-hour recovery period was successful, pulling the spacecraft out of its unexpected safe mode status. SMART-1 was a precursor to the upcoming fleet of lunar orbiters from other nations - specifically China, India, Japan, as well as the United States. For the SMART-1 impact campaign, ESA's Bernard Foing, SMART-1 Project scientist said other members of future impactor teams were invited to take part. As example, he pointed to members of the Lunar CRater Observation and Sensing Satellite (LCROSS) effort. LCROSS is a small, "secondary payload" that is hitchhiking its way to the Moon with NASA's Lunar Reconnaissance Orbiter, slated to fly in October 2008. It will arrive in the lunar vicinity independent of the larger orbiter. The LCROSS mission is comprised of a Shepherding Spacecraft and a Centaur Upper Stage that separate as the hardware approaches the Moon's south pole. Sensors on the Shepherding Spacecraft will fly through a cloud of lunar material tossed up when the upper stage smacks into the Moon - all in the hopes of spotting signs of water ice and other compounds. According to Diane Wooden, a scientist as NASA's Ames Research Center that's leading the LCROSS mission, the SMART-1 impact is an important precursor experiment for LCROSS, "and that strongly motivates my involvement," she told SPACE.com. Wooden is in Hawaii to make observations of SMART-1's impact using the NASA Infrared Telescope Facility (IRTF). She is stationed at the University of Hawai'i Manoa remote operations room. SMART-1 planners anticipated one recommendation in a Beijing Lunar Declaration that was produced at the July conference of the International Lunar Exploration Working Group. The declaration stated, among various items, that lunar missions should document their plans for end of life and coordinate impact observations from space and ground based facilities, ESA's Foing noted. "We shall pass along our experience to those controlling orbiters at the end of their missions," Foing added. Europe's SMART-1 was lofted into space on September 27, 2003. Making use of an ion drive engine-as well as tricky celestial maneuvers-the craft took a 14-month slow boat approach to arrive at the Moon. Lunar orbit capture took place on November 13, 2004. Initially planned to operate six months around the Moon, SMART-1 was later given a mission extension of one further year. SMART-1 is the first European spacecraft to travel to and orbit around the Moon. SPACE.com's Robert Roy Britt contributed to this story.